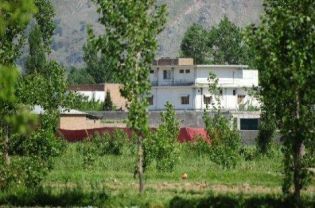 Osama Bin Laden's house. The Pakistan Army's Dairy Farm is about 200 meters to the left, married soldiers housing for the Pakistan Military Academy in 400 meters away to the right, and a 24 hour army check point in 150 meters behind the photographer on the main road. While the reliable press are reporting the location of Osama Bin Laden’s mansion in Abbottabad, they are so far way off. Not even close, in fact. Here are two examinations that are much more careful. Honestly, it’s people like this who give me hope for basic problem solving skills. The world press just chose the location for the center of town and reported it uncritically. After my several hours last night trolling through the press reports, I saw someone come up with this seemingly likely location. But I’m much more convinced by the Bilal Town location, as local press reports said it was “behind” the Army Housing Scheme Flats (here ) ~ 2 km SSE of first location (and ~ 6km ENE from town center, which is the default location for the town and spot everyone is erroneously reporting). I’m also persuaded by people who noted that the house isn’t on Google earth, as sat images there are from 2001 (some from 2005) and the house was built in 2005. So Bin Laden’s house would be right about here. Note the last two likely locations are both less than one km from and on the same road as the main gate for Pakistan’s “West Point” or Sandrington. The Kukal Road between the two has at least one permanent military checkpoint and you can’t turn around without bumping into a military installation. There’s a couple of news photos of the actual compound, and they match with the Picassa and Panoramio pictures you can find scattered around the development called “Bilal Town”, including one of a large “new construction” that required it’s own power pylon. It will be interesting to look in the backgrounds of these mapped snapshots and see if you can find the house. Also note that the descriptions of the attack from BEFORE we knew it involved Bin Laden (just one example here) say one helicopter shot down by men on the roof w/ an RPG, crashing and killing those aboard. This doesn’t sound like “no casualties” and suggests there were more dead on Bin Laden’s side as well. Is this important? Only to the extent that it shows Bin Laden was hiding in the middle of a Pakistani military base, living in a building conspicuous for many reasons (no telephone or internet, high walls with barbed wire, armed guards, burned their own trash, and I’m sure much coming and going). I saw one press story on a 2009 “passing out” ceremony from the Pakistan Military Academy, where the head of the nation’s military banged on about how they were winning the “war on terror”. The article notes those graduating included cadets from central Asian dictatorships receiving special training before returning home to ‘continue the fight’. The parade ground is literally within shouting distance of Osama’s compound. Someone on the upper storey might have sat and watched the assembled cadets. Good thing we started two wars and killed a million people while the ally that the west has been propping up for decades had him the whole time. One can’t imagine the motivation the Pakistani military (like the US military, by the way) in keeping Bin Laden lurking in the background. Or so we think. Also good they dumped the body at sea so no one will ever prove it, and we can keep busy arguing about if this one guy is alive or dead. The fact is, Bin Laden and his type were already on the way out in 2001. The cold war had helped destroy organizations throughout the Muslim world (and elsewhere) that genuinely expressed people’s anger at poverty, exploitation, imperialism and misrule. Right wing religious zealotry was one of the few paths left, and was funded (by the US and their clients) through the wars in Afghanistan and the dictatorship in Saudi Arabia. But no one wanted what Bin Laden was selling when they saw it up close. It was only through distant, symbolic attacks on distant, faceless victims, that these people gained any support. That’s long been over. The “Arab Spring” protests, suppressed so brutally, should have been the answer all along. Now they show just what a dead end Bin Laden was, whatever his fate. Why are we still killing, dying, and bankrupting ourselves when we know that? A careful observer named Dave at Ogle Earth blog has matched photo backgrounds of the house to landscape to this exact location. Remember, the satellite images predate the house. This seems exactly in line with pre announcement press reports of where the fighting took place. UPDATE 2: Here’s the confirmed location: Lat 34.1693549 Long 73.2425129 This is about 100 meters from the previous spot, and compound is visible on the 2005 imagery, along with all the walls and such that should have made it pretty obvious to the neighborhood. Details are here, as are the US Military images that match.